“I've got fresh grilled tuna for supper but I only bought 3 steaks and we've got one extra to feed and then there's a sleep over”. Where can I get a fresh tuna steak at this hour on a Friday I moaned to my work colleagues? Not only was the answer by return, it also came with a great new recipe for my grilled tuna steaks. It's essentially a rub moistened up with a little olive oil and then seared on the hotplate, not difficult and well worth the trouble of opening your spice drawer. 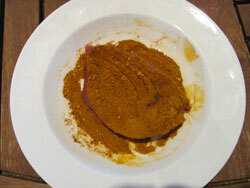 Not only does the spice mix add flavor it also adds a crust to the fish that seals in the juices - wonderful. To cook tuna perfectly I like to use a steak that's about 1 inch thick and give it a couple of minutes on each side, it should still be raw in the middle.When I slice into my grilled tuna steaks I like to see a nice oval of raw meat in the centre the diameter of which will be about ½ inch assuming your steak is about 1 inch thick. This timing is perfect not just to get the tuna right on the inside but it's also bang on for getting that spicy crust on the outside. So just to make that point again, I'm aiming for a spicy crunch followed by a melt in the mouth middle. That said, temperature is critical too; cook too hot and you'll scorch the spices so I'm looking for hot coals but not super searing hot. Spoon out all your ingredients, mix together and sprinkle over your tuna steak as if you were flouring it - you don't need to rub it in or pat it down. 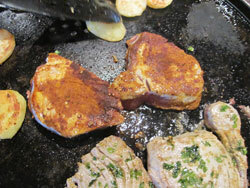 Dust off then drizzle with olive oil and you're ready to go whenever the hotplate is up to temperature. 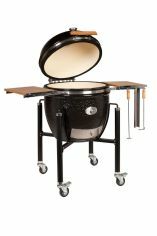 Make sure that your searing plate is well oiled so that the steaks don't stick to the grill grates. Place the tuna steaks onto the grill and it's a couple of minutes on each side on the searing plate and you're ready to serve. I served mine with a few sliced grilled potatoes.